This review will take a close examination of a product called Kate Ryan Skincare Vitamin C Night Repair Serum. The manufacturer advertises that this product is designed to help minimize hyperpigmentation and sun spots; promote collagen production for firmer, smoother skin; reduce lines and wrinkles, and deliver moisture for a hydrated and glowing skin. We look into the facts to see if this product lives up to the claims. The list of ingredients is quite long, therefore, we will list just mention some of the key ingredients. Rosehip Seed Oil is beneficial for skin healing, hydration, and reducing the appearance of wrinkles. Pomegranate Seed Oil has antioxidant, and photoprotective properties, that help with hyperpigmentation. Hyaluronic Acid improves elasticity and provides hydration because of the ability to penetrate the skin and hold water. Green Tea antioxidants help fight signs of premature aging from free radical damage. Olea Europaea (Olive) Fruit Extract is a powerful nutritive, excellent moisturizer, alleviates skin dryness and sensitivity. Phloretin is a flavonoid, potent antioxidant that improves penetration of other nutrients. Unfortunately, this product does not contain any patented ingredients, research shows that a well-rounded formula should contain at least 5 patented ingredients as well as 10% active ingredients which is not the case here. This serum is recommended for all skin types. Apply a small amount to face, neck and chest before bed. For most noticeable results and long-term benefits, use daily and consistently. 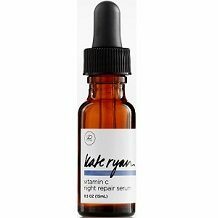 You can purchase Kate Ryan Skin Care Vitamin C Night Repair Serum through the manufacturer’s website for $35.00 a bottle. It is also available through Amazon. However, for some strange reason there are two prices on Amazon’s website, one for $35.00 and another one for $39, yet it is the same product, size, price and everything else. We did not find any discounts available on the product. Unfortunately, there is no mention of a money-back guarantee, which means that you are on your own if you end up buying this product. You will not be refunded if you are unhappy with the results or for any other reason. Kate Ryan Skin Care Vitamin C Night Repair Serum has the potential to provide you with the skin that you wish for. It contains natural properties that help fight free radicals, promote elasticity and hydration, reduce wrinkles and spots; making your skin look younger. We like that all the information that the customer needs to know about the product is displayed well and is easy to find on the manufacturer’s website. The serum is recommended for all skin types, which means that you do not have to worry if you have sensitive skin, oily skin, or any other skin issues. However, we have some concerns about this product. There are two prices displayed on Amazon. This might confuse consumers when they want to purchase the product through the website. It is not clear why there are two prices. It is a bit concerning that there is a long list of ingredients. When we read about each ingredient, we realized that there are many that do the same thing, which means that they are not all necessary. Furthermore, they could compromise each other’s effectiveness depending on the strength. Lastly, there is no money back guarantee offered by the manufacturer. This shows that your satisfaction is not their priority. For this reason, we would like to recommend that you look further.